The decision to scale down the deal for Rafale fighter jets from France to 36 aircraft instead of the originally proposed 126 effectively pushed up the total cost of the acquisition per craft, making it about 14% more costly, a report in The Hindu said on Friday. The report by N Ram — a former editor-in-chief of the paper, and now chairman of the company that owns The Hindu — pointed out that Dassault was charging a one-time ‘design and development’ fee of 1.4 billion euros for 13 “India-specific enhancements” to the jet in the original deal. This was negotiated down to 1.3 billion in the new deal. However, since the fee was to be spread over a much smaller number of planes, that still meant the per-fighter cost of this fee went up from 11.11 million euros to 36.11 million euros. As a result, the total cost per plane was 14.2% higher in the deal signed by NDA than in the one under discussion under UPA. Citing official documents, the report noted that three members of the seven-member Indian negotiating team under the Modi government had objected to the fee being charged for the India specific enhancements as “too high”. They were the joint secretary and acquisition manager (air) Rajeev Verma, financial manager (air) Ajit Sule and adviser (cost) MP Singh. However, they were overruled by the remaining four members of the team headed by the deputy chief of air staff of the IAF. The team resolved by a 4-3 majority that since the fee had been brought down from 1.4 billion euros to 1.3 billion euros and was a onetime cost, it should be accepted. It placed these facts before the Defence Acquisition Council (DAC) headed by the defence minister, which agreed with the majority view and this was later ratified by the Cabinet Committee on Security (CCS). The Hindu reported that various aspects of the deal were referred back to the DAC on five separate occasions and that each of the 10 contentious issues within the negotiating team was settled by a 4-3 split within the team. Citing the government’s notes on the decision-making process in the Rafale deal that were submitted to Supreme Court, Ram noted that while DAC was authorised to take a decision, it had chosen to “pass the buck” on to the CCS headed by the PM, which quickly ratified the majority decisions. 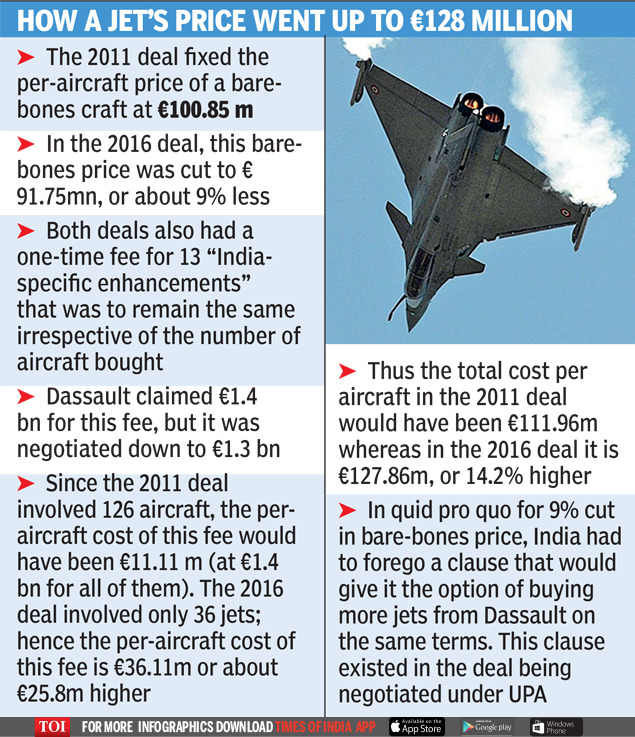 The report also said that the three dissenting members of the negotiating team had suggested using a fresh offer for Eurofighter Typhoons (Rafale’s competitor) as bargaining leverage in the negotiations, but the majority overruled this on the grounds that this offer was “unsolicited”, against the provisions of the defence procurement procedure and a violation of CVC guidelines since it was given after the bidding closed. Eurofighter had offered a 20% discount on its earlier price as well as improved aircraft capabilities, “favourable payment terms”, setting up a production line and a Eurofighter Typhoon Industrial Park in India and “a comprehensive training and support programme”. Further, it proposed faster delivery of Eurofighter jets by diverting deliveries meant for Germany, the UK, Italy, and Spain. The Eurofighter had been found technically fully compliant with the IAF’s requirement and had lost out on the deal in 2011 only because of the price factor. He raised doubts about whether the offer was truly unsolicited and argued that the NDA deal was in fact a new deal and hence the Eurofighter offer could well have been used as a leverage. The Hindu reported that the quid pro quo for a 9% lower price of the bare-bones jet was that there would be no “follow-on” clause. This, the report said, is standard practice in defence contracts and allows the buyer the option of a later contract for up to 50% of the original quantity under the same terms. In the UPA deal, there was thus the option to buy 189 (126 plus 63) jets with the same fixed cost of design and development for the India- specific upgrades. This clause was dropped in the 2016 deal.